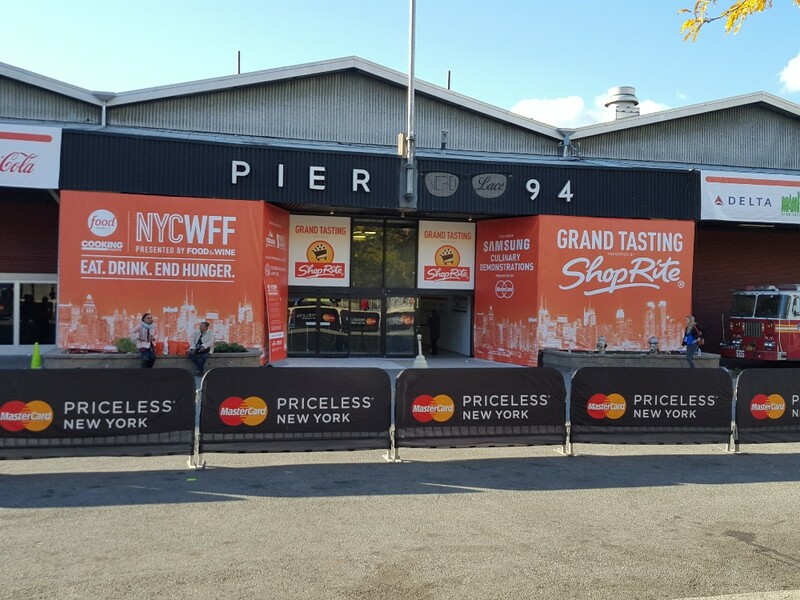 NYC Wine & Food Festival and Giveaway! Happy Foodie Monday y’all! Yesterday we attended an incredible event, for an amazing cause; The Grand Tasting at NYC Wine & Food Festival. 100% of the net proceeds from the festival go to the Food Bank for New York City and No Kid Hungry campaign. This year they raised over 8 million dollars. Fantastic! And we were honored to have been part of it and bring you our experience. This was our first time at The Grand Tasting. So allow us to give you an over view of what to expect. You receive a wrist band as soon as you scan your tickets. Your wristband has two tabs. Sorry, took my picture after the tabs were removed. One tab with a wine glass and another with a bag. Here I am thinking the logical thing; ID check for alcohol consumption, and coat/bag check. But no, of course silly me that wasn’t it. The wine glass is actually for a wine glass. 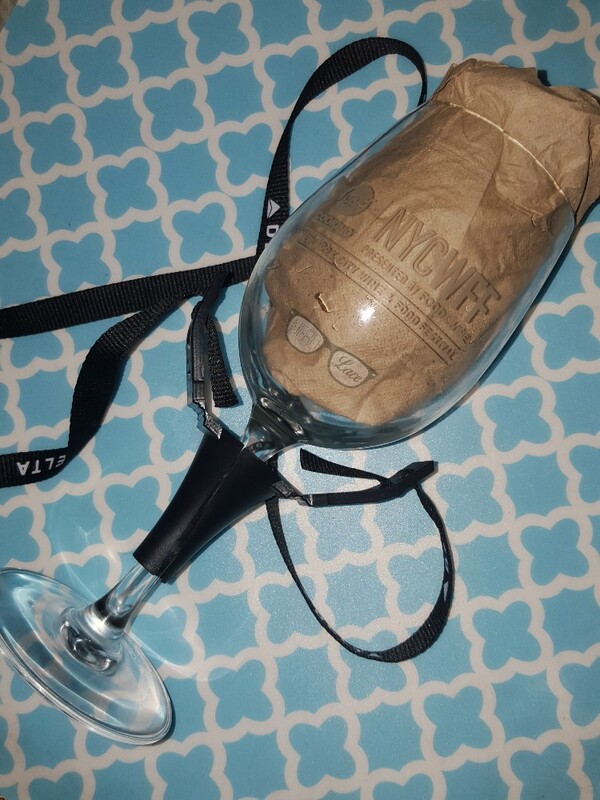 Yes, you receive a wine glass when you first walk in. 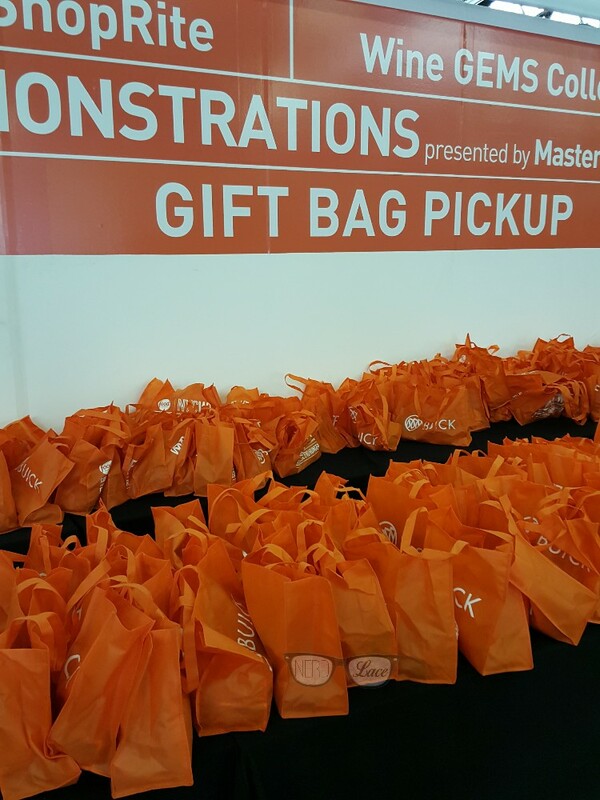 And as soon as you walk in, you trade your shopping bag tab for a gift bag, already filled with goodies. What happened after this point, was a bit of a blur. Saying there was food and alcohol at every corner, is an under statement. Let me put it this way, we were sharing the food samples. We wanted to try it all, but there was just SO much to try, it was impossible to actually eat a full sample. Think of it like this, imagine of a ton of restaurants from your area in one building passing you samples off their menu. 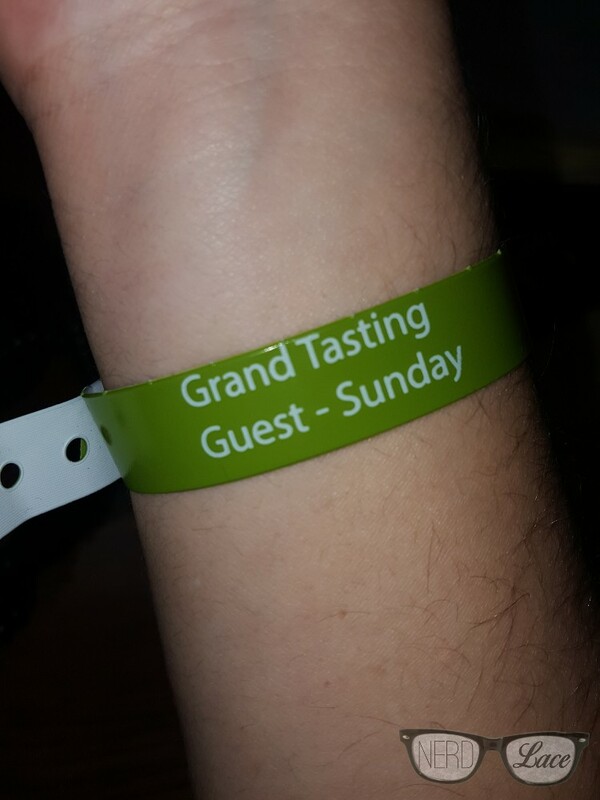 That’s exactly what the Grand Tasting is. Some of the best restaurants from NYC and surrounding areas letting you taste their cuisine. In other words, a foodie heaven. Here’s some of the food we enjoyed. We took as many pictures as we could. Most random thing I ate came from Earth At Hidden Pond and Executive Chef Justin Walker, was called “Chicken Oysters”. It’s chicken, squid ink, sesame, buttermilk, and isot chile. This dish looks weird at first, but it was incredible! I also, loved the lobster rolls from Burger & Lobster. Now, let’s talk adult drinks. Ever walked in to a liquor store and been overwhelmed at the choices? What do half of them taste like? Well, this was your chance to try wine and spirits. Favorite thing I tasted? They were a few. I spotted a mermaid bottle (of course I did), and it turned out to be a delicious coconut rum called, Sugar Island. It was so good, you could drink it straight. Now, since I am a whiskey and bourbon girl, I have to give top honors to Four Roses Bourbon. Their Small Batch Bourbon is so smooth you could drink it straight. As I’ve grown older, I’ve learned to enjoy and savor a well crafted drink. In order to take a break from eating and drinking, we did make it to a couple of demos. We caught the ending of Jaime and Bobby Deen demo, and even took selfies with them. Caught a glimpse of Andrew Zimmern. We caught the majority of Duff Goldman‘s cookie demo. And we ended with Tyler Florence. He cooked a 14lb turkey in an hour and a half. The trick to it is to remove the spine of the turkey. And instead of stuffing the inside cavity of the turkey, he stuffed in between the skin and the breasts. Why didn’t we think of this sooner? He placed the turkey on a roasting pan, and cooked it at 350 F for an hour and a half. The turkey was ready when it reaches 150-155 F. Because it doesn’t have that bone center, the bird being hotter than that temperature would dry the turkey out. Great news foodies! Tyler developed an great app, Yumovore (I believe that’s how it’s spelled), that is going to easily allow you to build and share recipes, as well as pictures of your finished product. It should available on iTunes in a few weeks. Now, let’s hope he has one developed for android. GIVEAWAY TIME! We are giving away a copy of the book Mermaids & Martinis by Hilary Pereira. Don’t host a party–host a memory. Everyone loves to throw the perfect party—the one all your friends talk about. Today, everyone is searching for ways to save and still do the things they love in a big way, and almost everyone is craving creative ideas and solutions to celebrate their lives in a big way–on a tiny budget. No purchase necessary. Open to US residents only. Winner will be announced on 10/20/2015 and will be contacted via email.